Sometimes when we think of Sarai/Sarah, we tend to remember how she let her barrenness humiliate her to the point that she went outside of God’s will to give Abram/Abraham a son. Today I am thinking of how she appears in the Bible as a great example of God’s ideal for a married woman, in spite of her impatience. There are two characteristics that mark her life: beauty and barrenness. Because of her beauty, even pagan rulers desired her, but she did not let it make her vain. It was her infertility that caused deep domestic humiliation and even disagreement in her marriage. She was treated terribly by other women in her family because they were fertile and she was not. Perhaps she could have saved herself some of that cruelty had she not given Abram her handmaid, Hagar, to mate with. But God has allowed that for His purpose, just like He does for all of us when we step outside of His will, and come to Him in repentance. Without a doubt, Sarah had beauty, brilliance, and creativity, but one quality that plants her in our memories and sets her apart is her unique and unequaled devotion to her husband Abraham. She shared not only her husband’s challenges and heart aches, but also his dreams and blessings. Never did she waver; she stood by his side through good choices and bad decisions, adversities and blessings, in youth and in old age. She is a fine example of a woman who loved her husband unconditionally and determinedly. Many wives today seem to take every opportunity to demean or badmouth their husbands in one way or another. I find that contemptible. True, selfless love will never behave that way. 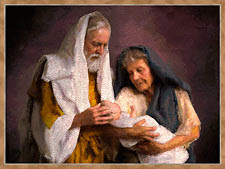 Sarah is titled as one of “the Holy women” of old because she committed her willing cooperation to her husband. From the Biblical account, it is apparent that Sarah was strong-willed; yet she chose to submit to Abraham, an attitude which God commended. She was consistently identified as Abraham’s wife, reinforcing the fact that God viewed the pair as one flesh. Together they were asked to believe that God would give them a son. Perhaps more than any other Biblical woman, Sarah stands to teach women two supreme characteristics of Godly womanhood: humble submission to their husbands in marriage, and fervent commitment to nurturing the next generation. As I mentioned above, it seems to be “the thing” these days for women to take the leading role as head of the home and demean the husband and knock him down every chance they get. And, we see results every day in the news of children who are left to their own devices instead of being nurtured as all children have a need for.